See how your workouts and diet compare over time with intuitive graphs and see if you’re on target to reach your goals. Exchange messages with your ‘traineo motivators’ straight from your online account. Share weight loss tips, give your fellow members encouragement or talk about anything else! Get your personal traineo.com page! 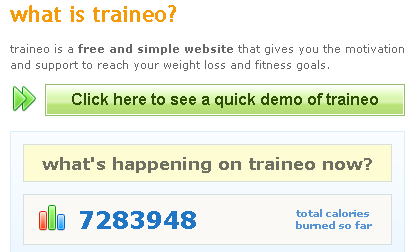 You’ll have your very own traineo.com domain where you can leave comments on your progress or comment on other pages with ease!